Brookstone has been making wireless speakers for years, but only now is jumping onto the Chromecast bandwagon. The company has now released updated models of the Big Blue Studio and Big Blue Party speakers, both with added casting functionality. The Big Blue Studio is already available from Brookstone for $129.99. The tower-like Big Blue Party, costing $249.99, is also now on sale. Both speakers have Wi-Fi and Bluetooth connectivity, in case you want to play music outside of a wireless network. The Chromecast functionality works exactly as you would expect, including multi-room support with the Google Home app. You can buy both speakers from the links above, or from any Brookstone retail store. 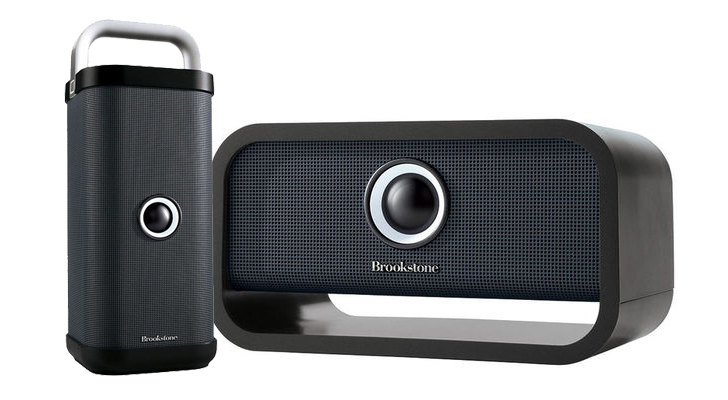 MERRIMACK, NH--(Marketwired - January 31, 2017) - Innovative product developer and specialty retailer Brookstone announced it launched new models of its popular Big Blue Partyand Big Blue Studio wireless speakers with Chromecast technology built-in. The two speakers can connect to any Wi-Fi network and stream music directly from the user's favorite apps such as Spotify, Pandora, Google Play Music and iHeart Radio. With Multi-room sync, multiple speakers can be grouped together to play the same song throughout the house. The Big Blue Studio indoor Wi-Fi/Bluetooth speaker retails for $129.99. The Big Blue Party indoor/outdoor speaker also streams via Wi-Fi or Bluetooth connections and retails for $249.99. Both Chromecast built-in speakers are available at Brookstone stores and online at Brookstone.com. "Our vision for Big Blue Wi-Fi Speakers with Chromecast built-in is to let the customer enjoy fantastic-sounding music in every room of her home, from her favorite apps, and to be able to control it all from her phone," said Vice President of Brookstone Products David Figler. "With Wi-Fi music streaming, she'll be able to enjoy higher sound quality, without interruptions from phone calls, and centralized control over every Chromecast built-in speaker on the network." Cast millions of songs with just a tap of the app. To stream music, the user simply taps the "Cast" button that's already built into Chromecast-enabled apps such as Spotify, Pandora, iHeart Radio, Youtube Radio, TuneIn Radio, and NPR One. With Chromecast built-in, the user can choose from millions of songs and podcasts. The free Google Home app, which is available for Android and iOS users, lets the user add, remove and group Chromecast built-in speakers on one's Wi-Fi network. Wi-Fi keeps the party going. One of the many benefits of streaming music over Wi-Fi is that, unlike with Bluetooth pairing, the user doesn't have to remain within close proximity to the speakers. Brookstone Audio Category Merchant Chris Netterwald puts it this way: "You can start streaming a song by casting from within, say, Spotify at a party and then run out to the store to get more ice. Because our Big Blue speakers with Chromecast built-in are streaming directly from the Wi-Fi network, your leaving the house won't break the signal, so the party keeps going." Wi-Fi never ruins the moment. When streaming music over Bluetooth from a mobile device to a speaker, the music can be interrupted every time a text, email or phone call comes in. "Whether you're really enjoying your music, dancing with friends, or spending some quality time with a loved one, the last thing you want to have happen is to have everything screech to a halt so you can take a call from your brother. With Big Blue speakers with Chromecast built-in, you can take the call if you want, but the music won't be interrupted at all." Wi-Fi or Bluetooth? Yes, both. "While we're tremendously excited for customers to upgrade to Wi-Fi streaming, we also made sure that both our new Chromecast-enabled speakers would also let people pair directly to their devices via Bluetooth wireless connections," said Figler. "This lets people stream music even when there's no Wi-Fi network available, like when they have their Big Blue Party indoor/outdoor speaker at the beach or on the sidelines of a soccer practice." Multi-room sync allows Big Blue Wi-Fi speakers to be grouped with Chromecast built-in speakers from other brands. This gives the user greater flexibility in building or adding onto multi-room speaker networks. Some other brands of speakers, such as Sonos, require using only their own speakers within a "closed" network. For best sound, place these speakers anywhere. Big Blue Speakers with Chromecast built-in are designed to deliver rich, room-filling music no matter where they're placed in the room. Big Blue Studio employs dual full-range stereo speakers, a subwoofer and a passive radiator for extended bass. The more powerful Big Blue Party features four full-range speakers placed at different angles for 360-degree sound, as well as an omnidirectional subwoofer and bass-boosting passive radiator. Big Blue Party is cordless, rechargeable and water resistant for use in any weather or by the pool. For more information, visit Brookstone.com and follow them at Twitter.com/Brookstone and Facebook.com/Brookstone. For more details about Chromecast built-in, visit chromecast.com/built-in.